Liver — are you a fan? 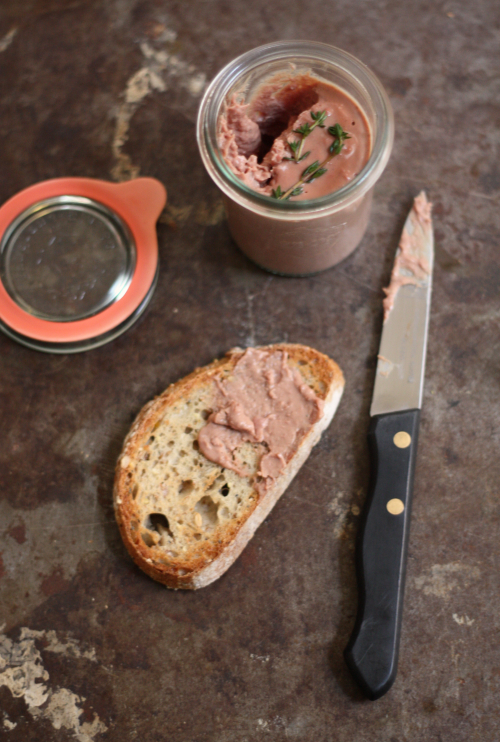 I am going to get around to sharing the recipes for both fried chicken livers and a calve's liver that I grew up with on the blog soon, but for now I couldn't wait to share this recipe for chicken liver mousse. While in NYC a couple of weeks ago, we enjoyed a liver pâté as an appetizer — which got me headed in the direction of today's post. This stuff is just so good, rich and a little decadent spread over a warm piece of toast. For the recipe, I turned to Julia Child and her cookbook Mastering the Art of French Cooking. Of course I used all of the modern conveniences and cut her recipe in half as I just could not have this stuff laying around to tempt me. 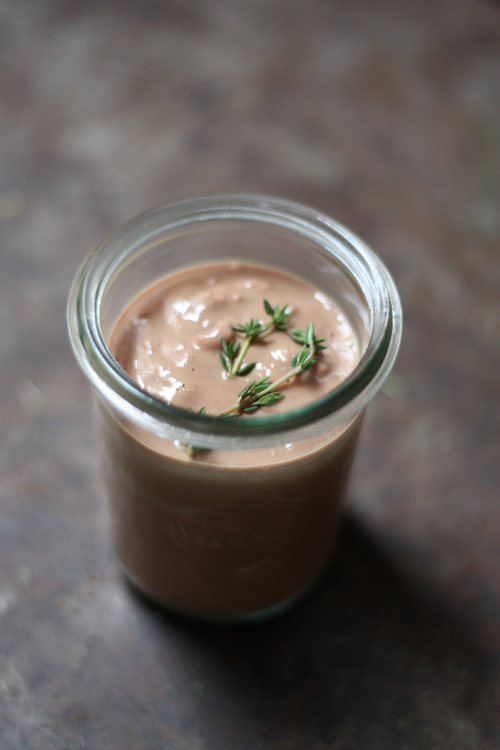 So let's see how simple it is to make some Mousse de foie de volailles or more simply, chicken liver mousse. **I just do not trust organ meat from a big box grocery store. 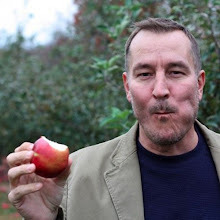 I would suggest visiting your local butcher or specialty grocery as they generally do carry a variety and it is typically sourced locally. If you are local to Richmond, I picked mine up at Belmont Butchery. Cut your livers in half and then into 1 inch pieces, removing any tendons. Melt 2 tablespoons of butter in a saute pan, adding the shallots and thyme leaves, then give a quick stir to coat. 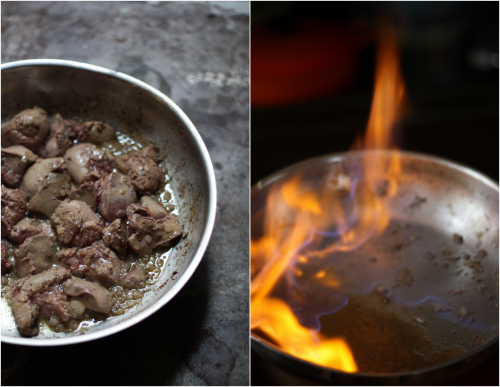 Add livers and stir. Livers should brown on all sides but still maintain a pink soft center, 3-4 minutes should do the trick. Remove from heat and place in a blender. Deglaze the pan with Cognac until reduced to 2 tablespoons. Careful, especially with a gas oven the alcohol from the Cognac will catch fire and burn off. Add this reduction to the blender. Add the heavy cream, salt, pepper, and allspice to the blender, blending until smooth. Then add melted butter and blend for several more seconds. 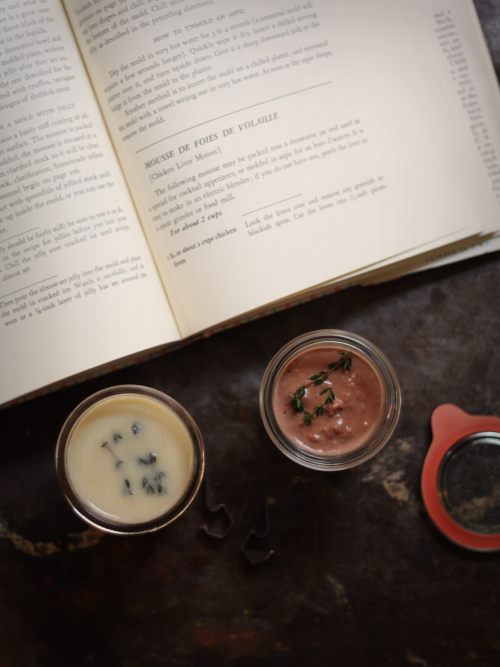 Pour mousse into decorative jars, garnish with fresh thyme and allow to set up in the fridge for 2-3 hours. 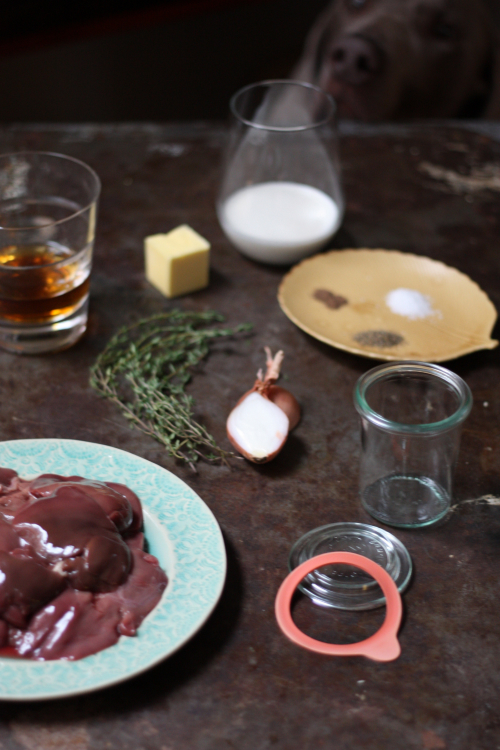 Once the liver is set, it is ready to serve over toast, baguettes or whatever you please. Storage Tip: If you note in the first picture, the jar on the left has a yellowish tint. I sealed this jar with some clarified butter to add shelf life to the liver. I am going to say this one sealed with the butter will be good for about 2 weeks and the one that is not sealed should be eaten in 5 days to be safe (which shouldn't be a problem in this house). Liver Mousse — what starts out as not such an eye appealing ingredient really does turn into a rustic, decadent, and oh so good appetizer or hostess gift. I hope you'll give it a try! I love this recipe and don't make it often enough - thank you Tim for reminding me! You are welcome and it really is so easy! 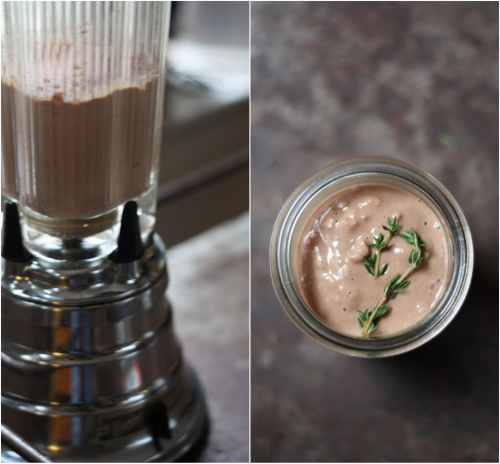 I never liked chicken liver until I had it in mousse form. It's so good when you add cream and butter and puree until smooth. Yes, cream and butter make most things better! I have a friend who freezes it to avoid having to eat it all at once. I will have to try that! Thanks for the tip.